We carry white, black & pink Sonicare DiamondClean toothbrushes in our office. The benefits of this toothbrush are vast. It removes up to 7 times more plaque from hard to reach places than a manual toothbrush, provides optimal cleaning between teeth and along the gum line for improved gum health in just two weeks, whitens teeth more than 2x better than a manual toothbrush in just 1 week., and it removes up to 100% more stains for whiter teeth in just 1 week. We recognize that when it comes to your oral care routine, taste matters. We have found that Fluoridex toothpaste has a lovely clean mint taste to it, and it works! 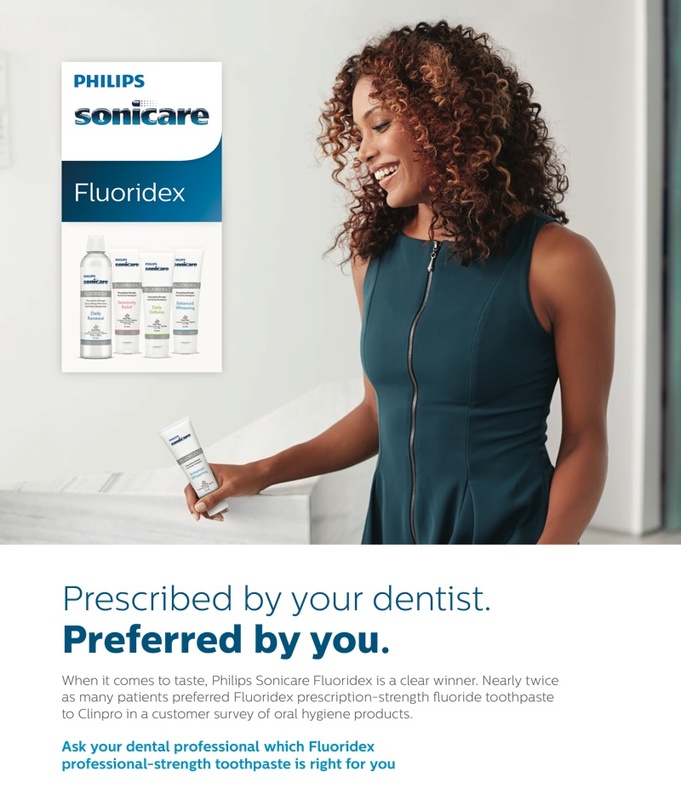 Philips Fluoridex toothpaste provides 4x the fluoride of non-prescription, over-the-counter toothpastes for superior defense against cavities and greater enamel resistance. We recommend this toothpaste is used at night time. Philips Breath RX system knocks out odors caused by bacteria at the source to provide superior fresh breath protection. This can help eliminate 99% of the germs that cause bad breath. This alcohol-free formula is a great defender in your oral-care routine. We carry a variety of whitening systems in our office such as In Office Zoom! Whitening, Custom take-home kits, as well as Zoom! Whitening Pens.